Keep more of your hard-earned money! Are Home Office Expenses A Risky Deduction? Home office expenses may be the most misunderstood deduction in the entire tax code. That’s unfortunate because millions of Americans actually qualify for this deduction. According to Forbes three million Americans never set foot in their company’s office and as many as 30 million work at home at least one day a week. This is particularly relevant for professionals such as attorneys. For years, it was rumored that deducting expenses for a home office guaranteed an audit. Some tax professionals were apparently not well versed in this part of the tax code and may not have given their clients all the deductions they were eligible for. Also, there have been a couple of changes that made it easier to qualify for this deduction – one, courtesy of the Supreme Court back in 1994, and another from Congress in 2007. So now you can feel more confident about claiming home office deductions without risking an audit. Is it your principal place of business? Do you use it to meet clients or prospects in the normal course of your business? Is it a separate structure not attached to your dwelling unit? Now, realize that your home office doesn’t have to meet all three requirements—any one of them can qualify it as a deduction. We’ll clarify this further for you so you can make an adjudication in your situation. If you have another office somewhere else but you only use it occasionally for administrative or management activities, then your home office will still qualify. Example: You are an attorney and you have a virtual office or shared office space where you meet your clients. Your home office still qualifies as your principal place of business so long as you use it to manage your business and keep your books and you don’t regularly do that at your virtual office or shared office space. Working Out of a Corner of Your Living Room? Your home office doesn’t have to be an entire room. You can use part of a room as long as it meets the requirements we’ve already covered. If you do have a “separately identifiable” space such as a workshop, studio, storage building or other space you use to create or store records, products or samples, then you can also claim that space as a deduction. But if you use these spaces for more than one business, both have to qualify to take the deduction. A qualifying space must be used regularly and exclusively for business. “Regularly” generally means 10-12 hours per week. To provide evidence for your deduction, take photos of your workspace and keep of log of time spent working there. Once you’ve determined that your space qualifies, you’ll need to calculate the proportion of your home expenses that can be applied to your home office. Start by calculating the percentage of your home used for your business. As you can see in this diagram, this person’s home is 2,400 square feet. The home office takes up 180 square feet or 7.5% of the total square footage. 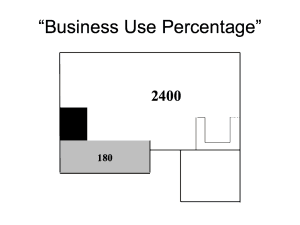 (Exclude common areas like halls and stairs to boost the percentage used for business.) Or you can divide your expenses by the number of rooms, if they’re roughly equal in size. Finally, deduct your business use percentage of utilities, repairs, insurance, garbage pickup and security. You should also plan to deduct direct expenses from your business, such as high electric bills for home office expenses or fast internet service installed especially for your business. Claiming a home office also increases your car and truck deductions, because it eliminates nondeductible commuting miles for that business. These deductions will help reduce taxable income and self-employment income from your business. If your home office expenses in a particular year are more than your net income from your business, you can carry forward the difference to future years. If the time comes to sell your home you’ll have to recapture any depreciation you claimed, or could have claimed, after May 6, 1997. And you can still claim the usual $250,000 or $500,000 tax-free exclusion for space you use for your office unless it is a “separate dwelling unit”. If this all seems like too much work, there’s a new “safe harbor” method that lets you claim a flat $5 per square foot (regardless of your actual expenses) for up to 300 square feet of qualifying home office space (regardless of what percentage it occupies in your home). If you use the safe harbor, you’ll continue to deduct your mortgage interest and property tax on Schedule A. However, you’ll forego any depreciation deduction. And if the safe harbor deduction reduces your business income below zero, there’s no carrying forward the loss. The safe harbor is certainly easier than the traditional method. However, using it might not let you claim nearly as much as the traditional method. The only way to know is to run the numbers and calculate the deduction both ways. Of course, this isn’t all there is to the subject of home office deductions, but it should give you a pretty good idea of how it works. There are intricacies we haven’t discussed which could increase your savings even more. Contact a tax professional for the specific details of your situation. There are many tax-saving strategies available to attorneys if they know what they are. Home office deductions are just one of them. At the end of the day, the goal is simple: to help you keep more of your hard-earned money.